Retired August 1, 1970. Died December 11, 1994. 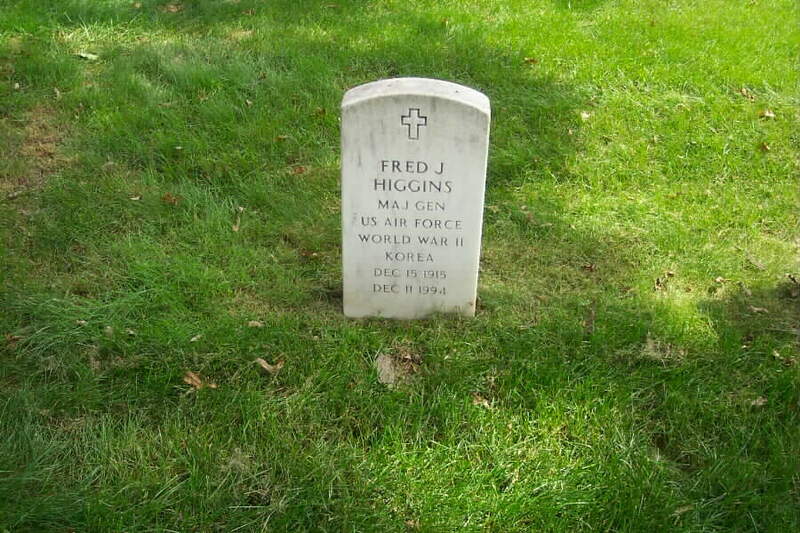 Major General Fred J. Higgins was Deputy Chief of Staff, Procurement and Production, Headquarters Air Force Systems Command, Andrews Air Force Base, Maryland. General Higgins was born in Glendive, Montana, in 1915. He graduated from Dawson County High School, Glendive, Montana, in 1933, and attended the University of Montana at Missoula, Mont., where he received a bachelor of arts degree in business administration, in 1937, and his bachelor of laws degree in 1941. He was commissioned a Second Lieutenant in the Infantry Reserve in June 1939 and was called to active military duty in October 1941. His first assignment was to squadron duties at Hamilton Field, California. In January 1942 he departed for an overseas tour of duty with the 35th Pursuit Group. From March 1942 until September 1944 he served in various materiel capacities in the China-Burma-India Theater and upon return to the United States was assigned to the Air Technical Service Command at Oakland, California. He attended the Command and General Staff School, Fort Leavenworth, Kansas, in 1945. From September 1946 until June 1947 he attended the Industrial College of the Armed Forces and in July 1947 was assigned to Air Materiel Command, Wright-Patterson Air Force Base, Ohio, serving in the Procurement Division until November 1950, when he was transferred to the Judge Advocate General's Department. In January 1951 he became the Staff Judge Advocate, Western Air Procurement District, Los Angeles, California. From September 1953 until June 1955 he was staff judge advocate at Oklahoma City Air Materiel Area, and from July 1955 to June 1958 was staff judge advocate, Air Materiel Forces, Europe. He returned to the United States to become deputy staff judge advocate, Air Materiel Command, and in July 1963 staff judge advocate, Air Force Logistics Command. He assumed duties as deputy chief of staff, procurement and production, Headquarters Air Force Systems Command in August 1967. His military decorations include the Legion of Merit, Bronze Star Medal, the Air Force Commendation Medal and the Army Commendation Medal. He was promoted to the temporary grade of Major General effective June 1, 1967, with date of rank July 1, 1962.